Delhi,22 July:Prime Minister Manmohan Singh expressed confidence of winning the trust vote and rejected allegations of horse-trading for winning support of MPs for the trust vote on Tuesday. "Anybody can make allegations. If somebody has proof show it," a combative Singh told reporters while leaving the parliament house complex late on Monday night at the end of the debate on the first day of the Special Lok Sabha session. The trust vote moved by Prime Minister Manmohan Singh on Monday is the eleventh taken in the Lok Sabha in nearly three decades since 1979. Of the ten trust votes taken in the last 29 years, the government of the day won six while in two cases each the incumbent prime ministers were defeated and simply resigned without facing the house. Interestingly, historical facts about trust votes saw Leader of the Opposition L K Advani and External Affairs Minister Pranab Mukherjee clash during a tense debate in the Lok Sabha today. Advani while opposing the Motion said it was certainly an "irony" that for the first time the prime minister himself would not be able to vote for his own motion of confidence. The BJP’s prime minister in waiting was quickly corrected when Mukherjee said it was not so. "Did I K Gujral vote for the confidence motion. Did Deve Gowda vote for the confidence motion," Mukherjee sarcastically asked. Like Singh, both Gujral and Gowda were not members of the Lok Sabha to be eligible to take part in the Trust vote. The concept of a trust vote started only in 1979 because in all the general elections before that – from 1952 to 1977 – the mandate was so decisive that there was no need for a confidence motion. The first time the need for a trust vote arose was in 1979 when Charan Singh was the prime minister after an earlier split in the Janata Party. Sensing he did not have the requisite numbers, Charan Singh did not even come to the house to face a confidence motion and resigned. The next time a trust vote was moved was a decade later when V P Singh became the prime minister in December 1989. He won but stepped down a year later after Congress joined hands with the BJP to ensure his government’s fall in the trust vote. Chandra Shekhar, who succeeded Singh, won a trust motion in November 1990 but resigned five months later after the Congress party under Rajiv Gandhi withdrew its support to the government over spying charges. Prime minister P V Narasimha Rao won a confidence vote in July 1991. His government lasted a full five years. Prime Minister H D Deve Gowda won a trust motion in June 1996 but lost in April 1997 when the Congress withdrew its support to his government. I K Gujral, who succeeded Gowda, won a vote of confidence in April 1997 but resigned in November after losing majority support. In 1996, Prime Minister Atal Behari Vajpayee resigned on the floor of the house before the confidence motion could be put to vote, admitting he did not have the numbers in his favour. Vajpayee, however, won a trust vote in May 1998 but lost the confidence motion in May 1999 by a single vote after AIADMK withdrew support. Vajpayee, thus, became the only PM to have lost a confidence vote twice. 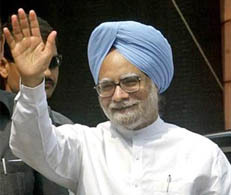 Prime Minister Manmohan Singh did not have to move a confidence motion in 2004 as he was assured of majority with the outside support of the Left.